Trailblazers allows campers all the excitement of a little longer week, but with extra attention and guidance from the counselors. Can you say, “FUN!”? That’s Trailblazers for you – swimming, boating, adventure course, games, a cool counselor, campfires, singing so loud it shakes the roof. 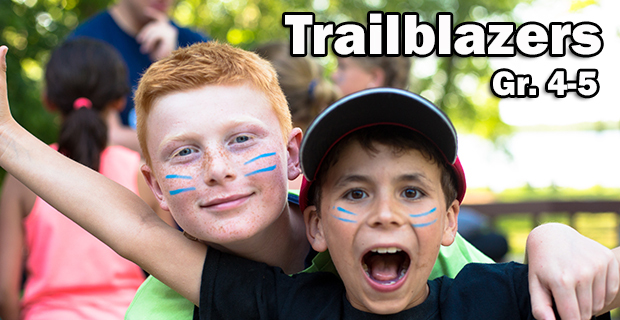 Trailblazers is an exciting first step in your faith journey at Bible camp. Trailblazers I, III, IV, V and VI begin at 5:00 pm on Sunday and concludes at 7:30 pm on Wednesday. Trailblazers II (June 25-28) begins at 11:00 am on Tuesday with the closing program at 2:00 pm on Friday.